Despite the regularity of disasters, social science has only begun to generate replicable knowledge about the factors which facilitate post-crisis recovery. Building on the broad variation in recovery rates within disaster-affected cities, I investigate the ability of Kobe’s nine wards to repopulate after the 1995 Kobe earthquake in Japan. This article uses case studies of neighborhoods in Kobe alongside new time-series, cross-sectional data set to test five variables thought to influence recovery along with the relatively untested factor of social capital. 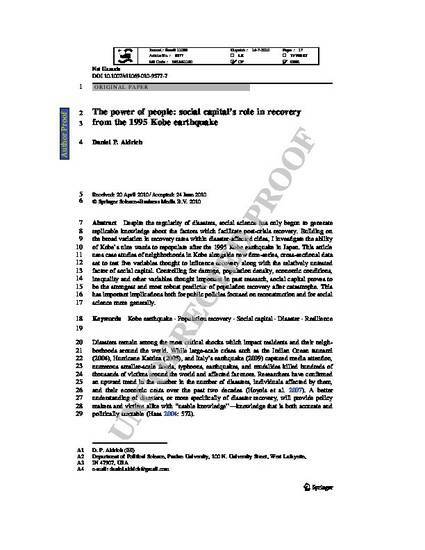 Controlling for damage, population density, economic conditions, inequality and other variables thought important in past research, social capital proves to be the strongest and most robust predictor of population recovery after catastrophe. This has important implications both for public policies focused on reconstruction and for social science more generally.